I first saw Live Age of the Gods Roulette back in early February 2017, when Playtech revealed they were developing “Live Experiences” for live casino players. 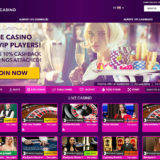 At ICE I saw the first mock ups of what the next stage would be, which was to create a branded Live Casino experience integrated with popular slot themes. Since February I’ve seen the experiences limited to packaging the tables from each studio into an “experience”. For example you’ve got The Grand Royale Experience, The Sapphire Experience, the Emperor Experience and a separate experience for any dedicated tables. Fast forward to September 2017 and the new “ONE Experience – Live Age of the Gods Roulette” has been launched by Playtech. 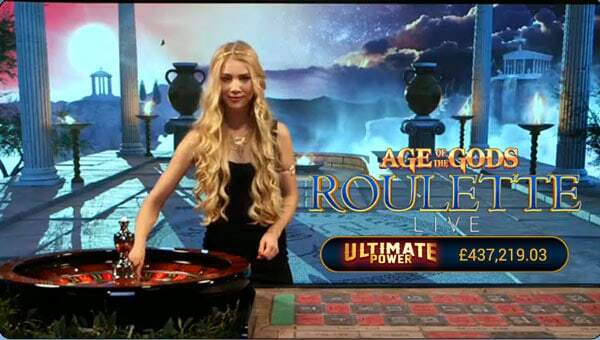 A Dedicated Live European Roulette table themed with Age of the Gods. 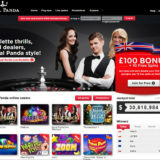 A 26m Video Wall maintains the theme and allows real-time information on jackpot winners and promotions to be displayed. 4 Randomly triggered Progressive Jackpots, shared and seeded from across the whole Playtech network. There are 4 progressive Jackpots which are seeded from all Age of the Gods games across the Playtech Network. Power – has an initial value of €50 (or currency equivalent). Extra Power – has an initial value of €500 (or currency equivalent). Super Power – has an initial value of €5,000 (or currency equivalent). Ultimate Power – has an initial value of €100,000 (or currency equivalent). The Progressive Jackpots are seeded by taking a small proportion of each bet. It’s 0.99%, but not less than €0.01 and not more than €10 per game round. The Jackpot Round is randomly triggered during game play. You match 3 Jackpot symbols to win or if you wait for the 30 second timer to count down a prize will automatically be awarded. Take a quick look at some video footage of what you can expect to see. If you’re interested in playing this version of Live Roulette I can recommend Bet365 & Betfair. “Age of the Gods has been a phenomenal success in casinos across the industry and continues to drive incredible growth for Playtech and our valued partners. 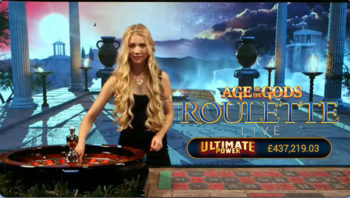 The innovative and market-first launch of our new Age of the Gods Live Roulette linked to a four-tier progressive jackpot that offers massive cash prizes, will significantly increase the cross-sell of the product for our licensees across both channels and enhance the gaming experience for players. Playtech has again demonstrated its determination to lead the Live Casino market through innovation and by working side-by-side with our leading licensees. Playtech are focusing on the total player experience. The improvements they have made over the past 18 months has paved the way for these changes. 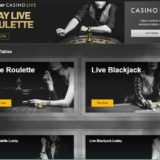 It’s not a new concept, NetEnt led the way with themed live Roulette, but this is the first we’ve seen with a progressive Jackpot tied into a Slots brand.